Litter tray issues are one of the most common concerns with cat owners but in many cases, can be easily solved and is often one of the first signs that something is not right with your feline family member. Cats are very clean animals and will naturally use a litter tray so if your cat is not using their tray, there’s always a reason. It can be frustrating for cat parents but please DON’T ever punish a cat for urinating or defecating outside their tray. This will just make the problem worse and increase their anxiety and stress. Patience and perseverance is key! The first step is to thoroughly clean the area where your cat has urinated. You want to make that place less appealing to toilet. Try moving a water bowl, bed or toys onto the cleaned area, place double sided tape or foil on the surface to discourage them returning to that spot. Make the litter tray more appealing by following the steps below. With patience and a few changes, you should see an improvement. If you are unable to rectify the issue, please ensure your cat has visited your local vet to rule out any health issues. KEEP IT CLEAN – Scoop soiled litter at least once a day and replace litter regularly to keep clean and odour free. Scrub the tray with hot water and unscented soap at least once a week. TRAY TYPE AND SIZE – The tray should be appropriate to the size/age of the cat. A large cat will not feel comfortable using a small tray. Older cats might struggle to access a high sided tray. Many cats do not like hooded trays, particularly those in multi pet homes who can be easily snuck up on and surprised. TYPE OF LITTER – The litter type depends on your cat’s preference. Use a shallow bed of litter about one to two inches deep. Cats are sensitive to smell so avoid scented litter and liners. You could try 2 litter trays with different types to establish which one your cat prefers. Avoid crystal litter for kittens, who can easily ingest crystals while grooming. 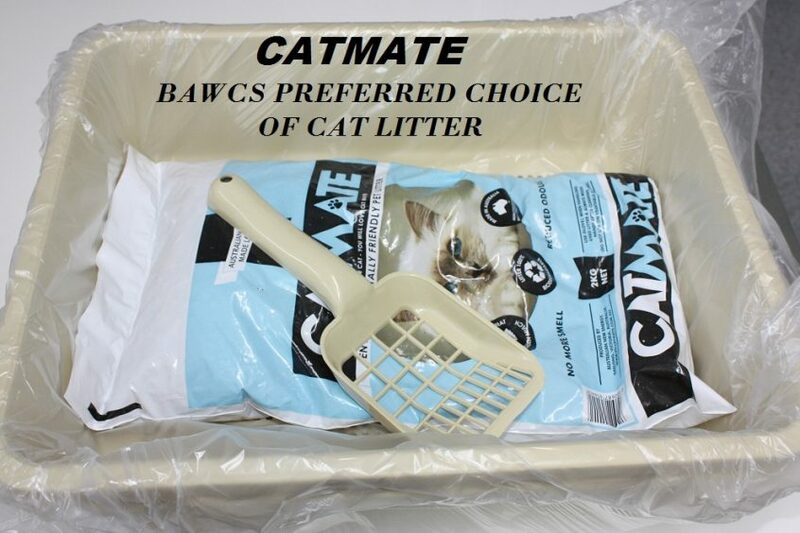 CATMATE is BAWCS preferred cat litter in both our Adoption Cattery and our Cat Boarding Facility. This eco-friendly wood pellet litter is easy to use and super absorbent. The natural oils inhibit the growth of bacteria, which reduces odour. LOCATION – One litter tray per cat plus one extra, and placed in different areas. Choose quiet but easily accessible areas. You don’t want to eat next to the toilet and neither does your cat! Avoid placing food/water bowls near litter trays. Converting an outdoor cat to a litter tray? Try placing a tray at the door where the cat previously exited and gradually move it to a more suitable location. If you’re able to provide an outdoor enclosure attached to the house, you can use timber or brick to frame a large sand box or loose soil box where the urine drains away and you just need to remove the faecal matter. PAIN/FEAR/STRESS – Your cat will avoid using the litter tray if he/she experienced pain urinating. If you suspect this may be the case, please contact your vet immediately. Your cat may also avoid the litter tray if it is being bullied by another cat or if he/she had a fright while using the tray. You may need to move the tray to a different location and always ensure you have enough litter trays in different positions for multi cat households. Cats can react to even slight changes in the household or to the normal routine so events such as moving house or a new pet/family member are particularly stressful.